Treat the following file extensions as the text files - Specify the list of the file name extensions (separated with commas) that you want to be treated as the text files. 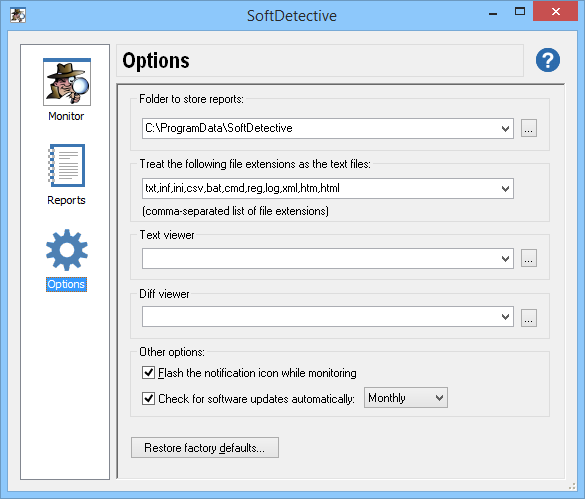 If during the monitoring a text file is modified, SoftDetective will attempt to detect the changes to the text inside of such a file. For other (non-text) files, SoftDetective only keeps track of the changes to the file time, size, and version information. Text viewer - Specify the path to the application that you want to be used by SoftDetective when you choose a command to view a text file. (You can choose such a command by right-clicking on a text file in the report and choosing the View command from the shortcut menu.) If this box is empty, then Windows Notepad is used as the text viewer. Diff viewer - Specify the path to the application that you want to be used by SoftDetective when you choose a command to view the text differences between the updated and original text files. (You can choose such a command by right-clicking on an updated text file in the report and choosing the Diff command from the shortcut menu.) If this box is empty, then an error is displayed when you attempt to use the Diff viewer. Flash the notification icon while monitoring - While a monitoring session is in progress, SoftDetective displays a notification icon in the Windows notification area (next to the system clock). You can use this option to control the flashing of the icon: if you find the default flashing behavior too distracting, clear this option to display a static icon instead. Check for software updates automatically - Select this option if you want SoftDetective to check for updates periodically without asking you every time. The updates are never downloaded or installed automatically, you will be always asked to confirm whether you want to download and install them. Restore factory defaults - Press this button to discard any changes you've made to the options on this page and restore them the way they were originally, when you first installed SoftDetective.